Blindness in ignorance refers to the state of materialists blind to God’s greatness. Even if God appears before them and manifests his universal form, as did Krishna before Duryodhana, they dismiss it as some illusory magic. Their blindness is not physical, but attitudinal. Unawareness in transcendence refers to the state of exalted devotees who have such an intimate relationship with Krishna that they are no longer conscious of his divinity. Even when Krishna manifests his supreme mystic power, as he did to Yashoda by showing the universe in his mouth, they downplay the vision and soon resume their normal intimate relationship with him. Superficially, both obstinate materialists and superordinate spiritualists seem similarly unaware of Krishna’s divinity. But their consciousness is entirely different. Materialists’ blindness arises from their intense aversion to Krishna and it perpetuates their material existence; devotees’ unawareness arises from their intense affection for Krishna and it enhances their intimate absorption in him. Significantly, these two states are caused by two different kinds of illusory energies. Blindness in ignorance is caused by Maha-Maya, the great illusory energy that keeps souls away from Krishna. Unawareness in transcendence is caused by Yoga-Maya, the divine illusory energy that intensifies the connection (yoga) between the soul and Krishna by highlighting his sweetness over his greatness. 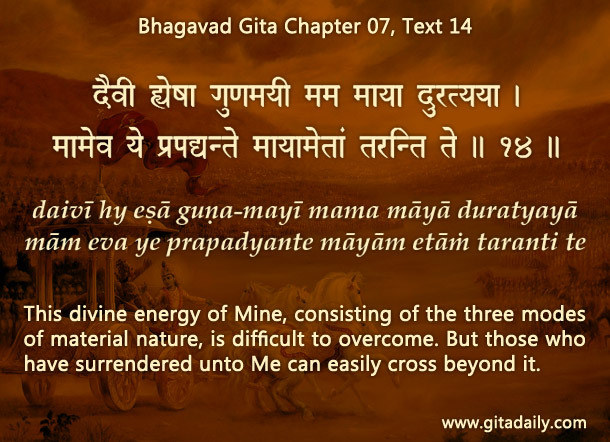 The Bhagavad-gita (07.14) mentions the first kind of illusory energy and points (09.13: daivi-prakriti) to the other energy through which great souls take wholehearted shelter of Krishna. Yoga-Maya takes them beyond comprehending Krishna’s greatness to relishing his sweetness. The resulting ecstasy is so great that it relegates awareness of his greatness to the background, just as the sun’s brightness during daytime renders the stars invisible. By practicing the potent process of bhakti-yoga, everyone can rise to unawareness in transcendence from wherever they are presently, even from blindness in ignorance. Such a wonderful explanation of 2 concepts of blindness in ignorance and unawareness in transcendence. Salute to your wisdom which nourishes us daily. Thank you very much prabhu. Thank you, Krishna Dhan Prabhu, for your kind appreciation. Happy to be of service in sharing Krishna’s message.